It is well known that RCP bundle is not the Maven’s best friend. Peacemaker between them is Maven’s plug-in Tycho. I was recently migrating my free time RCP based project into Maven Tycho. My goal was to share dependencies between normal Maven project and Tycho driven project. Plain maven project is needed for running TestNG tests (TestNG is not supported by Tycho). It is needed to find existing bundle or create one for every dependency. Unhandy. If I would use manifest-first approach, bundle dependencies wouldn’t be visible by non Tycho maven projects. I would need to have two set of dependencies. Redundancy. It is working only for Maven build and dependencies are not picked up by Eclipse. Finally got the clue here (in the last approach) and came up with solution that is maybe not that pretty, but the dependencies are specified at one place and even Maven as well as Eclipse can pick them up. It is using some aspects both mentioned approaches. discography-organizer.parent – contains various properties used by child poms. Is also used to run build of all sub-modules. And that’s it. 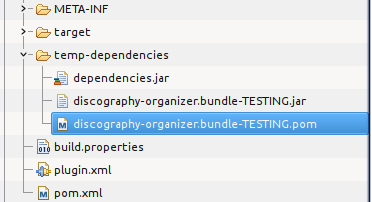 Dependencies needed by main bundle or test artifacts are packed into jar files. This workaround has side effects that I really don’t like. Dependencies are ugly packed in one jar for main bundle. But I can live with that because this approach enables me to combine features of Tycho and non-Tycho maven plug-ins. I am planning to use another Tycho’s features (automatic building and JUnit plug-in tests) and I have good start point for it.